The personal stories of Egypt’s 18-day uprising is the focus of a new book “I Diari Della Rivoluzione” (Diaries of the Revolution), launched in Italy this week. The book tells the story of the January uprising through the eyes of six bloggers and journalists and the material they wrote during the 18 days or immediately after. A narrative evolves, as paths intersect and perspectives change, interweaving the personal experiences with the political upheaval and nationwide protests. The story goes beyond Tahrir Square and the protests, to draw a broader picture of Cairo at the time. Spanning the period between Jan. 25 and Feb. 11, the book ends as another lengthier chapter in Egypt’s ongoing revolution starts. It features activist and consultant Mahmoud Salem, aka Sandmonkey; journalist and development policy consultant Mohamed El-Dahshan; web designer and social media consultant Tarek Shalaby; science journalist and adventurer Nadia Al-Awady; business journalist and writer Amira Salah-Ahmed; and journalist Sarah El Sirgany. El Sirgany and Ahmed are both editors at Daily News Egypt. The book was compiled by El Sirgany. Italian journalist and editor at Corriere della Serra Viviana Mazza wrote the preface and Egyptian activist and journalist Hossam El-Hamalawy wrote the introduction. Mazza, El Sirgany and El-Hamalawy celebrated the first launch of the book at the Internazionale Festival in Ferrara. Days earlier El-Hamalawy was awarded the Anna Politkovskaja journalism award at the same festival. Internazionale, an Italian magazine, brings together journalists, writers and artists to the small north Italian city every year for a festival combining literature and world affairs. Its 2011 agenda featured a panel on Egypt’s political affairs post-Jan. 25, featuring El-Hamalawy, El Sirgany, journalist Issandr El Amrani and writer Ahmed Naje. The launch of the book was also celebrated in Milan and Rome, where the publisher Fandango Libri is based. The book had initially started as a series of columns written by El Sirgany in January and February 2011, for the Italian daily Corriere della Sera. Translated into Italian by Mazza, the columns were then developed, with the help of literary agent Maria Cristina Guerra, into the book’s current format, a multi-perspective personal narrative of Egypt’s iconic uprising. As published by Daily News Egypt. Regret and loss of faith are probably the worst experiences anyone can go through. I tend to sympathize more with people who are fixated on actions or decisions they can’t reverse and those who consciously lose faith in something that defined them at one point —be it religion, politics or even faith in a person they loved or respected. Both either create a bitter vacuum inside or a monster that chews away a person’s soul and mind, especially if mixed together. When I meet someone experiencing them both at the same time, I can’t help but feel sorry or try to help, regardless of how much I disagree with that person’s actions. 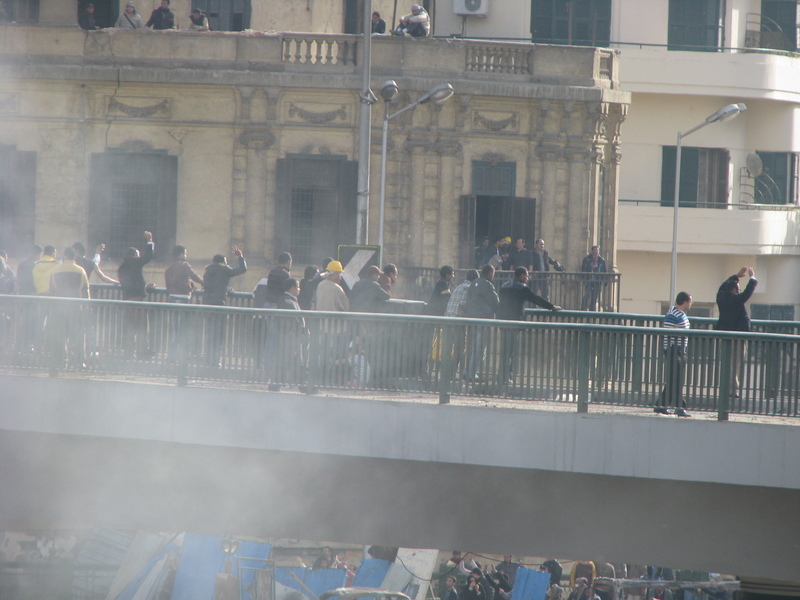 People standing on 6 Oct Bridge throw rocks at protesters in Tahrir Square on the morning of Feb. 3. This month I met a man who was going through this. He was my taxi driver. (I too hate Cairo cabby anecdotes but bear with me; it just happens that the man in this story is a taxi driver, and I assure you it’s not another lazy attempt to poll Egyptians à la foreign journalists by interviewing the man driving me to work). It was early April and we started the conversation with his worries about the “gains of the revolution.” He thought the revolution that toppled Mubarak was being robbed. The regime was still there, alive and kicking, and the military was vague in its actions and commitment to reform, he told me. His worries gave me the impression that he wasn’t only supportive of the demonstrations but almost militant in his views. The conversation of course took us to economy and consequently tourism. “The problem isn’t just about security,” I told him. The lies propagated by state media during the 18 days of protests, which vilified demonstrators, described them as foreign agents and spread fears of spies planted amongst Egyptians, had a much worse impact. The word ‘foreign’ had become synonymous with ‘spy’. And since those who propagated the lies and state TV hadn’t yet apologized for them or denounced their earlier statements as pure fiction, we were still in the dilemma. As much as people had wanted to take a picture beside one of the army tanks filling the streets, many still dream of catching their own spy, or basically any foreigner (or foreign-looking Egyptian) they deem suspicious. “Don’t remind me,” he eventually interrupted me after remaining strangely quite during my long explanation. There was a hint of shame in his voice that I only recognized later. “We were misled by the media,” he said. “We weren’t working, we couldn’t know what was happening for sure,” he added, referring to the early days of the protests, particularly from Jan. 25 to Feb. 1. “When Mubarak gave his speech [on Feb. 1], I saw a broken man. I was touched. I cried,” he continued. In that speech Mubarak said he would step down in September and won’t seek reelection. “We wanted stability, and the media was saying that those in Tahrir were foreign agents that wanted to destroy the country,” the driver added. He was standing on Sixth October Bridge throwing rocks at protesters below, when a taxi stopped and a woman got out before the exit to Tahrir to walk down. “I thought he was foreign. She had this accent that I thought was foreign, but eventually realized was the way she talked. “I yelled at her asking where she was going and she said it was none of my business.” He explained that her defiance angered him, but it was his realization that she was carrying medical supplies to the “spies” in Tahrir that got to him. After that he carried on with his self-assigned task, throwing rocks at protesters. He was steadfast in his conviction and goal. But the first seed of doubt was planted when he saw the resilience of the protesters. “I thought we were going to drive them out in a couple of hours. But they were getting stronger. The people around me were paid thugs. Those below believed in something; they would retreat and then come back stronger.” He saw the camels and horses brought all the way from the Giza Pyramids Plateau, on the outskirts of the city, to Downtown Cairo. The protesters, 11 of which died on that day, were increasing in number and were wearing out their attackers, who were getting less. The driver decided to go home, not sure what to make of this. “It was only when I heard of the billions Mubarak has that I realized I can’t support this man.” He decided to go to Tahrir and see for himself what the people there want. He went through the streets of Downtown leading to Tahrir. “I saw the youth protecting the streets, organizing entry to Tahrir in such a beautiful way.” He was impressed and on that moment he started supporting protesters and their demands to topple the regime and its president, who stepped down on Feb. 11. But to this day, he’s tormented by what he did to this woman on the bridge. He feels ashamed of what he did. **Mubarak was remanded in custody for 15 days, renewed by the prosecutor on April 22 for another set of 15, pending investigations into corruption charges and involvement in ordering the killing of protesters in the early days of the revolution and on Feb. 2. Most of Egypt’s top officials, including Mubarak’s two sons Alaa and Gamal, are facing similar charges and are now in Tora Prison pending further investigations or trials. Disbelief. It took me a few minutes to process the seconds-long announcement. It was short enough to fit in a tweet. But it was mighty. President Mubarak has stepped down. I broke into tears when it downed on me. Protests worked. Peaceful street action worked. Egypt is free, for the first time in my life. I was born in 1982, a year after Mubarak assumed power. For 28 years, he was the only president I’d lived under. On Feb. 11, 2011, this changed. It was a victory for martyrs and for protesters whose patriotism was questioned. When it was time to celebrate, the entirety of Egypt took to the streets. I could hear the sounds of car horns, ululations, fireworks and cheers as I edited the monumental story for my newspaper. Egyptians were celebrating their rebirth. Tears were abundant. When an Armed Forces spokesperson acknowledged the martyrs with a military salute, everyone in the room, including me, cried. It was the first official acknowledgment of their sacrifice. They’ll be in our hearts, as we celebrate tonight and when we start rebuilding tomorrow. Their blood didn’t go in vain. This ran in Italian in the Corriere Della Sera. Foreign journalists became the target on Wednesday. As Pro-Mubarak mobs, believed to be thugs and undercover police, tried to storm the pro-democracy protest in Tahrir Square, anyone with a camera became a target. Deadly clashes saw people on horses storm Tahrir to attack unarmed protesters in a surreal scene. The attack on journalists there by Pro-Mubarak protesters was similarly orchestrated. A journalist friend said if you can’t run, don’t go there. By the next morning, the target wasn’t simply people with cameras, but anyone who looked remotely foreign. State TV and phone calls aired live by private satellite TV have been blaming “foreigners” for mobilizing the Tahrir protesters and turning them against their country. Two of our Daily News Egypt reporters were attacked by mobs while doing field reporting in a district away from Tahrir. “They are foreign; they are asking questions,” the mobs said as they tried to beat them along with any Egyptian that dared defend them. An army officer saved the reporters. Another was running trying to disperse crowds attacking other foreigners. Mob mentality took over and people were charged. I stood watching in disbelief, anger and fear, mourning my once safe Egypt. I drove a French-American journalist to the airport later that day. In the morning he said he’d ignore his embassy’s call to evacuate and stay in Egypt. After the attack he packed his bags. We had to avoid roads known to be dominated by the Mubarak mobs. We made it to the airport safe, but I felt I was smuggling drugs not driving a friend across the city. The president’s speech late Tuesday night created a split that was evident on Wednesday morning. Those in Tahrir said that lives lost prevented them from leaving. Mubarak gave promises, not decisions. But for others outside, the president has made unprecedented concessions. Life should go back to normal. “Yes we want the demonstrations to end but I would never chant for Mubarak,” a man told me on the bridge overlooking central Cairo. I saw a truck carrying pro-Mubarak protesters heading to downtown. The scene was reminiscent of elections, when state-run businesses send their employees to vote for the ruling party’s candidates. But what I thought would be merely provoking demonstrations turned to be an organized attack of plain-cloth police and thugs on those camped in Tahrir for 8 days. It was brutal, more than Friday and Saturday. Tahrir has been kept free of any weapon-like material; protesters wanted to keep it peaceful. Unarmed, they were belted with rocks but eventually responded to fend themselves. It turned ugly as the Pro-Mubarak people, at one point on horses and camels, used Molotov cocktails. Hundreds were injured and people died. Hopefully, the Wednesday carnage would be the squirming of a fleeing dictator. Revolution Diaries: Jan. 31 – Are you ready? Egypt has gone beyond a standoff phase. We live in two worlds, each intent on ignoring the existence of the other. On one hand, the president is holding on to power and making insignificant changes to the cabinet that are cosmetic at best. On the other, protesters are not even paying attention to what he’s doing; they just want him to leave. No one is budging. What to do? The opposition has called for a million man march on Tuesday. By Monday night, tens of thousands have flocked to the central Tahrir Square. They plan to stay the night there, waiting for their brethren to join them. I can’t speculate what Mubarak is doing meanwhile, but I don’t think he’s watching TV. Otherwise, he would have heard the same word over and over again on all channels except State TV: Leave. There is a similar state of schizophrenia in the city. A couple of hours into the curfew, as I crossed from central Cairo to the Eastern suburb where I live — to spend the first night home since Friday — I was nervous for the first time. It was a feeling I didn’t experience at the height of the violent crackdown on protesters on Jan. 28. The military check points surrounding the presidential palace and the neighborhood watch groups on literally every corner made the city feel like a war site. Maybe it was civil war, against a faceless enemy — identified as a gang of thugs and looters in some circles and as disguised policemen executing a scaremongering scheme in others. The people there seemed oblivious to the raging demonstrations that roamed the same streets days earlier. Maybe they had participated in some earlier in the day or will do later on. It wasn’t clear. Spending the night on the other side of the city, I myself felt detached from the ongoing revolution – having the TV and phone as my only connection in an ongoing internet blackout. But that’s only physical detachment, because I’m already gearing up for tomorrow, ready for the million man march. I’m sure others are doing the same. Sunday started with a dead body and ended up with a tiring long string of check points. Again the days have merged and there was no telling which was today and which was the day before. But sometime early morning, we got a tip through twitter that a dead body was thrown out by a police car in Mounira. I woke up Ian Lee, my colleague and DNE video journalist and we headed out. We drove, parked in Zamalek and walked to Tahrir. People who set up barricades on the street leading from Qasr El-Nil Bridge to Tahrir were checking IDs of the few who wanted to get into the now-iconic site of mass demonstrations in central Cairo. At 8 am, thousands were still there chanting, calling for Mubarak to step down, under the watchful eyes of the army. From the looks of it, they had all camped in Tahrir overnight. The street between Al-Mogamma and The American University in Cairo was flooded with water. Further up on Al-Qasr Al-Aini Street, army had a forceful presence. Tanks and soldiers lined the once busy street that houses the Parliament, the cabinet and leads to many ministries including the Interior. A couple of burnt down security trucks on the side were a reminder of the clashes between civilians and the police. In a side street following that of the parliament, a group of three men in their 40s and 50s were standing as part of the neighborhood watch. At the time we were there, civilians policed all the side and back streets, with army nowhere to be found except on Qasr Al-Aini and the area surrounding the Ministry of Interior. Cars coming out of the ministry that morning had shot at the neighborhood watch, wounding one of them, the men told us. Their theory was that top police officers who had been hiding there since Friday evening or even before wanted to flee but were scared of the now-empowered citizens. The unspoken feeling was that the days of corruption, torture and intimidation were over. One of the tree men, who identified himself as a top executive in a multinational bank (details removed upon his request), told us about the dead body. A sliver Toyota without registration plates threw it at checkpoint and ran. At the following check point, neighborhood watch checked the driver who presented them with a police ID, state security. The men assure me they saw the ID. After letting him pass, they found the men manning the earlier checkpoints running after the car, telling them they shouldn’t have let the car passed. The body had a gunshot wound in the abdomen. It wasn’t bleeding, the men stressed. The man must have died earlier and was later shot to cover up the cause of death, they theorized. The body that was thrown outside the Mounira Police Station was left there for 3-4 hours. The Mounira Hospital refused to come collect it, saying it was the responsibility of the Morgue. Their hands were already full treating the wounded. A resident in the area told us later that a car from the hospital took it. Residents had covered it in a bed sheet, in a sign of respect for the dead. After spending two nights at the office, it was time to go back home. My mother has been home alone (my father has been stranded in Alexandria and my brother has been helping me over the past couple of days). We couldn’t print the paper on Friday, after the 6 pm curfew was imposed at 5.30. The mobile networks and the internet were down. We wanted to print it on Sunday. We did. This meant we had to be done by 3.30 so we can deliver our content on CD by hand to the printer. For someone who constantly works under tight deadline, Sunday’s was one of the most challenging. We did put the paper up and managed to restore our website and update it from reporters based in the office and spread across the city. But it was after 5 when we left the office. Civil checkpoints were already set up more than an hour ago. Men from our street walked in front of two cars carrying reporters and editors to clear our way to the main road. There, the man heading the neighborhood watch, a physician, rode in our car to take us through. The area was the most organized neighborhood watch I had seen that day. As we stopped at a checkpoint on every corner, he gave instructions to the men manning it. A new system and a new color of identifying headbands were being used that night. Systems had to be changed to avoid infiltrators. The 6 October Bridge was eerily empty. We were advised to speed through. Salah Salem Road was manned by army and republic guards. Checkpoints and detours. Checkpoints, search and detours. Checkpoints and detours. It seemed never ending. The area leading to and surrounding the presidential palace was completely sealed off by tanks. Once inside Heliopolis, civil checkpoints reigned. I’m not easily scared, but the unexpectedness of the process left us tense. There was no way of knowing who is manning the next checkpoints. Each area had its own set of codes and systems and we had to adapt to their requests. The most important thing is to keep car saloon light on and drive slowly. And some men, who were standing there for the second or third night in a row, were understandably tense too. One man thought he had the right to rebuke us for staying out this late, it was 7 pm. We finally made it home. Our friends in the other car, who had ventured further in Heliopolis took an extra hour of civil and army checkpoints. Once home, I was glad that the demonstrations in Tahrir were oblivious to the curfew that has paralyzed the city that never slept. The chants for Mubarak to step down were still loud. Our reporter there was heading to the office to put together a video report. Now the curfew has been moved to 3 pm. This means that people have to empty the streets earlier and civil protection have a longer period of time to cover. The army made it clear on Sunday that it was serious about imposing the curfew, unlike the two previous days. But contrary to what State TV had suggested –that the armed forced would firmly deal with violators – the army didn’t arrest anyone; it was merely checking cars/pedestrians, albeit rigorously. In addition to reports that citizens have been arresting thugs that turn out to be police, other factors led me to believe that the state of fear spread across the capital is a government tactic. The looting that happened on Friday after police disappeared with the curfew was somewhat plausible. People needed money and it was sitting there unguarded. According to TV interviews, some men with no criminal background found others looting and joined. But it doesn’t make any sense for a thief, who is by nature a coward, to see all the men armed with batons, knifes, guns and other professional and makeshift weapons and yet tries to engage. Many of the areas guarded are mainly residential, which means that looting would be difficult and money and valuables aren’t guaranteed to be there, unlike stores. Looters were surprisingly aware of all store locations in all areas as if they have studied them and planned for the thefts for months before that. Also implausible. Someone suggested that many people are now concerned with protecting their homes than they are with protesting. It’s true for many people, even though demonstrations haven’t waned. But they definitely could’ve been stronger. Police is said to be deploying back in the country after three days of complete absence. Whether it’ll re-engage with protesters is yet to be seen. Clashes with police, especially with those left near the ministry of interior have already left at least a hundred dead. And people are not backing down. On Saturday morning, it seemed that Friday hasn’t ended. Not because of the possible historic nature of a day that could be marked as the start of the revolution, but there was no point where it ended and Saturday began. Wary of a curfew that was largely ignored and lured by the scarce internet access in a day of communication blackout, the paper’s editors and writers decided to spend the night together at the office. At 7 am, when the curfew ended, Cairo’s streets were typically empty. But slowly traffic picked up, as Cairenes locked by curfew and fear of looters overnight rushed to make it home. A warm bed never felt better, but only for an hour. A hospital was a more important destination. I had to check my head injury before going back to the streets. (I’m fine). There were many issues on the line for this budding revolution. The army was deployed on Friday and it wasn’t clear if it would support the regime or protect the people from police brutality. Egyptians had vowed to return to the streets after the President said in a Friday speech he’d form a new government, instead of stepping down as they demanded. As the city grabbled to count its fallen protesters, the army turned to be on non-engagement mode. Most of the tens of thousands that poured into Tahrir since Saturday morning marched the streets without teargas or the rumored live ammo. It was only near the interior ministry that battles had taken place with deaths that are still being counted. The euphoria of the day before was there and increasing with the same rate as the numbers on the streets. The army imposed an earlier curfew at 4 pm, but until 8 demonstrators were still chanting down with Mubarak. With the images of morgues filled with bloodied bodies of protestors, people knew they’ve and already are paying the price. They more than deserved the fruits of their revolution. Over the past few years, protests never attracted more than a couple of hundred people at best. There were tens of thousands on streets on Friday. The scene of chanting protestors filling main streets was euphoric. Change was near. It was supposed to be a small step toward change. A scenario of police allowing Cairenes to march freely down the streets like January 25 wasn’t far off. But unlike Tuesday, the violence started early on January 28. Yet, in the midst of the teargas, water cannons, the rubber bullets and the pellets, it was the friendly spirit, the intent on keeping it peaceful and this never-seen-before fearlessness that shined through. Protesters were offering vinegar and soda – said to reduce effect of tear gas – to strangers, now their brethren. Aside from chocking on teargas which left burning sensations in eyes and skin, the main fear was of having a canister fall on someone’s head. My head. Police had no issue firing canisters right in the middle of any crowd. Few moved from the front lines with blood-covered faces. It became clear it wasn’t just a concern. At times, taking a photo seemed like a hefty task. Run for your life if you are the front; leave any other thoughts for later. Fearless young men picked up canisters and threw them away as soon as they hit the ground. It was those who led, who took it upon themselves to clear the way off the continuous flow of teargas for the thousands behind. Alas, teargas wasn’t doing the trick. Water cannons, rubber bullet and pellets were the new weapon against protestors chanting “Peaceful” as they marched on. The anti-Mubarak chants were abundant, but that was a peaceful demonstration. Those who wanted to attack the riot police conscripts were prevented throughout the day. These ‘peaceful’ intents ended with the first baton landing on my head and others’ as they turned back and ran. Panic reigned as people, drenched in pouring water, tried to retreat. I got tangled up and fell, luckily in a clear spot or I would have been fodder for shoes. The scene of the pellets covering the bellies of other protesters and the man having his head stitched on the streets made it clear. This wasn’t a peaceful demonstration. It was a battle to reclaim back a country withering under the 30-year-rule of an autocratic regime. Egyptians were there to stay. The fear that might have stopped them from confronting police or even demonstrating was overpowered with anger. They were now armed with stones. They took over armored vehicles and now they seem to be taking their country back.